Husband-and-wife builders Henry and Brooke Jones of plandandpillow have a thing for remodeling houses. 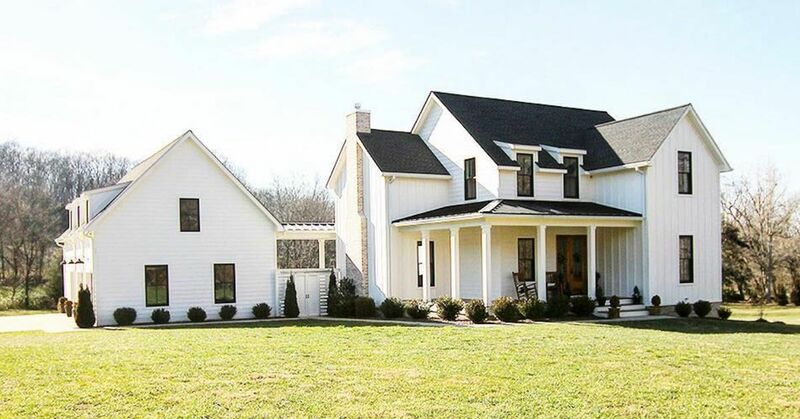 The duo's latest labor of love is their modern farmhouse situated in the small Tennessee town where they live with their two small children and two-year-old cavapoo, Mollie. Awash in an airy color palette of white and gray, the home's rustic-meets-contemporary design will have you yearning to DIY the range hood and swap those sliders for barn doors. Inspired by the white modern/coastal farmhouses on the island of Palms, South Carolina, the Joneses wanted to build their own version that would be just as beautiful but livable all year for their family of four. For the exterior, they went with clean lines, a simple, minimalistic design and creamy white paint (Cream Delight by Valspar). Black windows and a standing seam metal roof added modern flair, and industrial lighting from Houzz finished the look. The Joneses know first impressions are everything, and they wanted the exterior's clean, welcoming vibes to extend into the home, right from the front door (a custom-made barn door, that is). White shiplap walls in a knotty pine, industrial lighting, and black metal railing captured the modern feel the couple was trying to achieve. Another custom barn door – this time painted in a soft gray – leads into the dining room, where the centerpiece is a driftwood ceiling pendant hanging above. Sheer linen curtains keep the room light and open, and a blue oriental rug from Joss and Main adds some color underfoot. In the kitchen, an expansive island serves as extra prep space and a cozy breakfast nook. Light oak furniture complements wood-beam ceilings and a custom-made wood range hood. Stainless steel appliances complete the neutral color palette. In the living room, the Joneses faked the look of reclaimed wood beams by staining box beams made from 1-by-6 pine. They continued the winning formula of combining airy neutrals with unobstructed light and topping it of fwith a modern light fixture. A mud room is a must for families with small children, and this one is the perfect pit stop for kids with muddy boots. It features ample storage for jackets and other outerwear. It serves double duty as a favorite spot for their pup, Mollie, to relax. To keep the bedroom light and airy, the Joneses once again opted for a neutral wall color, white curtains, and light wood furniture and accent pieces. Colorful pillows, textural throws and small potted plants add pops of personality and dimension. In the master bathroom, a custom-built barn door separates the freestanding tub from a separate toilet room, so bathers can enjoy a soak in peace. Light stone tile work, creamy paint and light wood flooring and valences complete this airy oasis.